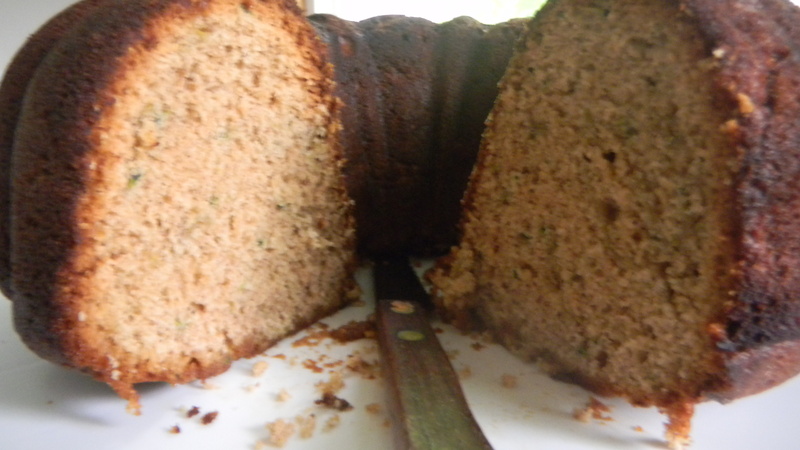 Have you tried to make Auntie Valerie’s Zucchini Bread yet? No? You should. It’s delicious. I recently tried tinkering with the recipe to try to make it more health-friendly. That cup of oil sure makes bread taste good, but it’s not so good for your body. 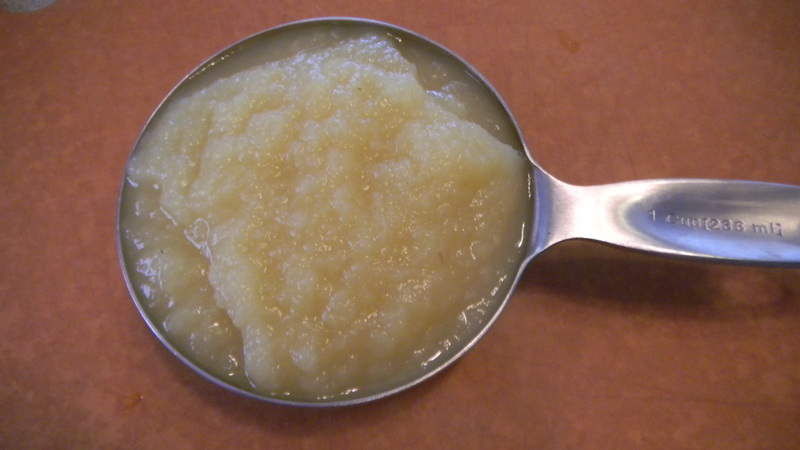 The solution I came up with to make the bread a little healthier was to substitue the whole cup of oil for a cup of unsweetened applesauce. Yep, an even exchange. I “neutered” the bread too, meaning I didn’t add any nuts this time. I did everything else exactly the same. 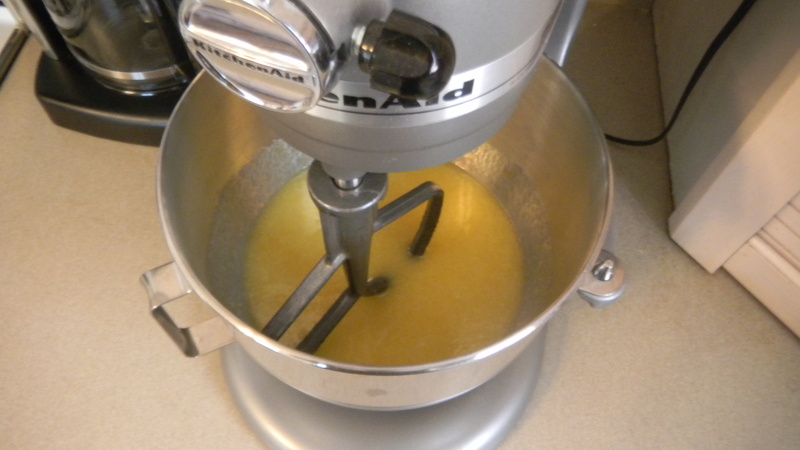 When creaming the eggs, sugar, and applesauce, the mixture looked thinner and it didn’t “cream” in a traditional sense. 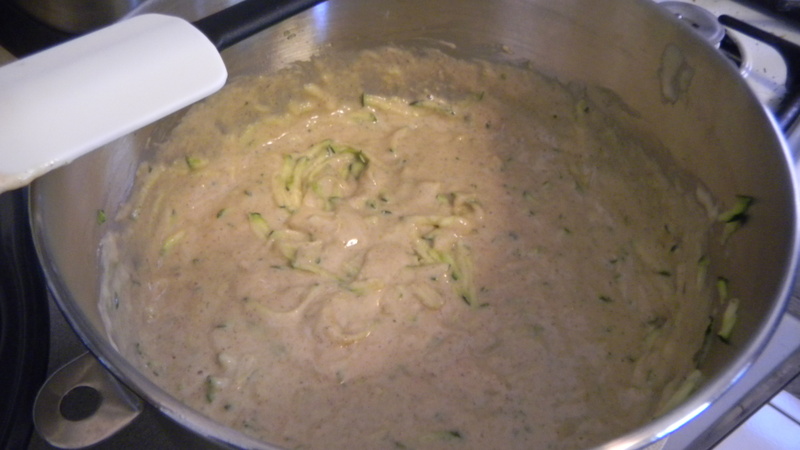 The batter seemed to be a lot thinner too, even with the zucchini added. I baked the bread in a bundt pan for an hour. It came out looking a little burned, which made me think that perhaps the applesauce made the bread bake quicker, which means I should have taken the bread out about 5-10 minutes before I did. Bummer. But, when you cut into it, the bread is definitely cooked all the way through, and not burned. It didn’t taste burned either. Hmmm. Maybe it was the ghetto oven in the apartment. It’s been known to be way off from the temperature I set it to be. In any case, the bread was actually quite good. It tastes a touch sweeter, in my opinion, but the bread was more dense and not as crumbly as it is when it’s made with oil. The verdict? I’ll definitely make the zucchini bread with applesauce again, but it won’t happen every time I make it. Try it for yourself and let me know which way you prefer yours. So you neutered the bread! lol; that was very clever of you!